We may have found the confectionary embodiment of a magical mess. I don’t know what could be more fitting than swirling melted candies into a mesmerizing design and sprinkling the final product with bits of beautiful sugar shapes. 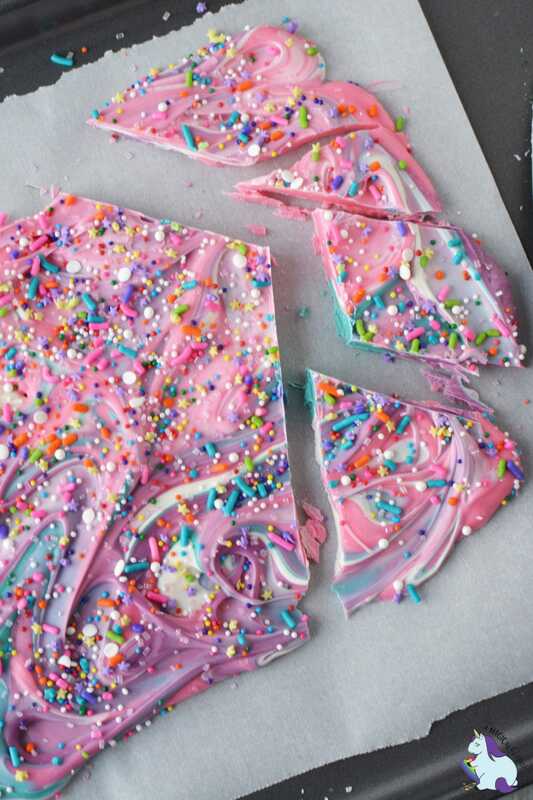 This magical unicorn bark is the perfect party treat for themed birthday parties, showers, weddings, or any occasion requiring something sweet and whimsical. When discussing something delicious, the word bark doesn’t seem very appetizing–unless you’re a desperate squirrel. 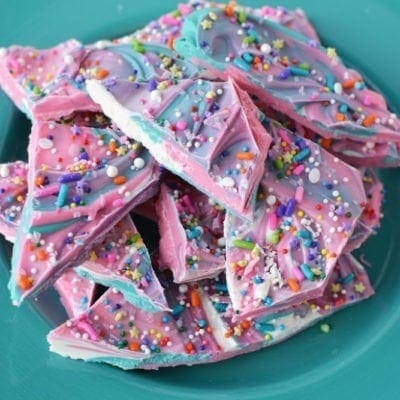 However, the term started being used thanks to the rough appearance of a traditional chocolate bark candy. The layers of chocolate and nuts closely resemble the outer layer of a tree. Just for fun, imagine a forest with trees covered in this bark. I wonder what kinds of fruits or nuts those trees might bear. If you’re trying to take a themed party to the next level, perhaps using this treat, literally, in a mini forest display would yield something legendary. Perhaps each tree produces a different type of Runts? Or, maybe licorice branches extend out to hold colorful leaves made of fruit leather. Clearly, my imagination can run these images all day–as I sit here salivating in a daze. If anyone decides to take this recipe to the next level, please let us know! We’d love to see it and share it! 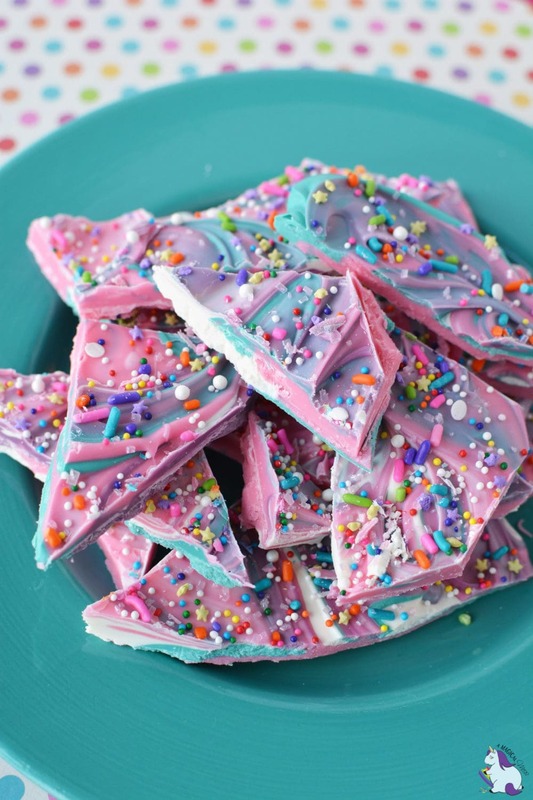 This unicorn bark is so easy and fun to make! It's perfect for birthday parties with a magical theme. Place 25 candy melts into a resealable sandwich bag and do not seal shut. You will have 1 bag of each color, lavender, white, and turquoise. Set aside. Place pink candy melts in a microwave safe bowl and microwave according to package directions. Stir well and set aside, keeping warm. Place bags of candy into microwave and heat for 60 seconds on 50% power. Knead and flip bags over. Continue to microwave in 30-second increments at 50% power, kneading after each heating until smooth. 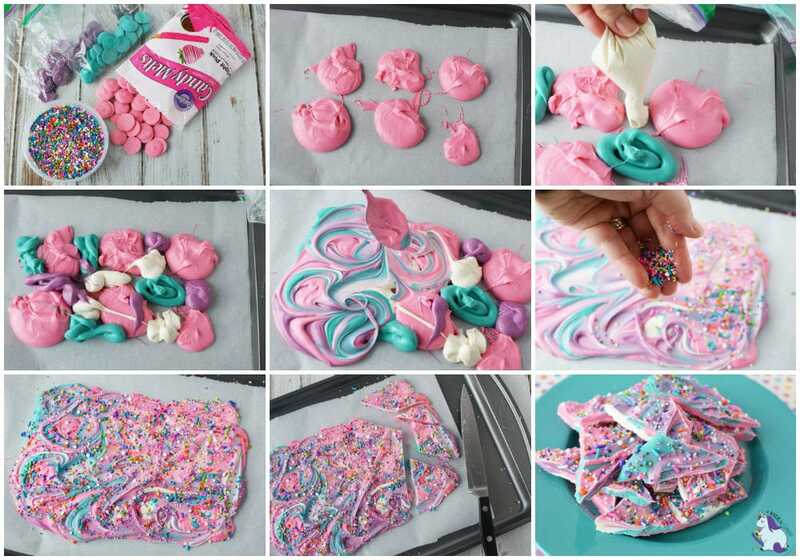 Drop dollops of pink candy onto prepared baking sheet about an inch apart. Snip the ends of the bags and add other colors in between the pink. Use a spoon to swirl the colors together. Top with a generous amount of sprinkles. Set aside until firm, or place in the refrigerator for 15 minutes. Use a sharp knife to cut apart bark or break carefully. Serve on a magical dish, and store any leftovers in a sealed container. Use separate dishes for each color instead of plastic bags for a more environmentally friendly method. However, if you're in a pinch, the bags make for easy clean-up. 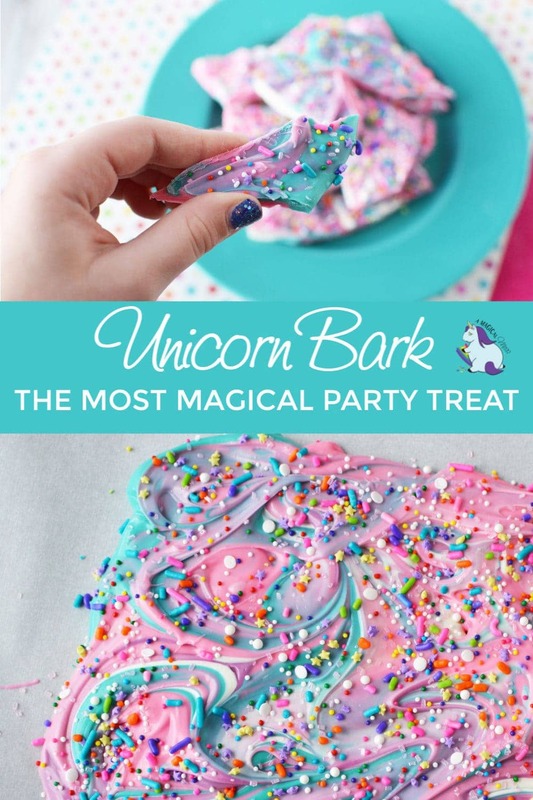 What event on your calendar would benefit from this magical unicorn bark? This would be SO FUN for a birthday party. It’s so sparkly and magical. I love it!